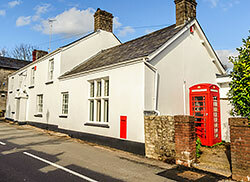 The Old Post House is located in the small village of St Fagans, on the Western fringe of Cardiff. The Old Post House is directly opposite the entrance to St Fagans National History Museum, so it makes an ideal base for those visitors who are wishing to explore the museum and surrounding areas. There are six individual and beautifully furnished bedrooms all with en suite facilities, flat screen TV, free WIFI and luxury toiletries.